This is the third post in my summer professional development series. So far, I've written about Infusing Tech One Lesson at a Time and Easy Tools to Techify Your Classroom. 2. Introducing technology tools that the students will be using all year long. First, I have written about the back to school activity I have created. Then, I have offered a short guide for you to use in creating your own. One of the questions I challenged myself to consider this summer was, "How will I give an overview of some of the tech we'll be using this year without putting the kids to sleep?" And also without wasting a ton of time, which we never seem to have enough of. An idea came to me when I was looking over some of the "getting to know you" activities that I've used in the past to help foster an environment of collaboration. Why not combine the two? Why not integrate the tech introduction into a "getting to know you" activity? I teach a diverse set of students, so thinking of something that will apply to them all is no simple task. I started by considering common ground that all students will have at the beginning of the year. And I thought of one thing--they are all returning from summer vacation. Summer vacation means different things to different students. For some, it will mean trips to Europe. For others, it will mean forty hours behind a cash register. Sadly, for still others, it will mean having to worry about where their next meal will come from. But they are all returning from summer break. -A choice board with nine tasks. Students select one task from each row to complete. -Each task requires using a technology tool to complete. -Each tool is demonstrated through a video tutorial. -Students bring the tasks together into a Google Slides Presentation (so they can familiarize themselves with that particular tool). -They share the presentation in Google Classroom. -Students review one another's presentations and use them to complete a scavenger hunt. If students took pictures over the break (which many of them will have), one of the video tutorials teaches them how to embed those pictures into Flippity Flash Cards and how to create those flash cards. If they watched a movie or read a book, one of the tasks shows them how to open a doc, write a short report on it, and then transform the report into a word cloud image. One of the tasks introduces web research tools by requiring them to briefly research one of three topics about summer and use those web tools to organize their research and create a bibliography. I feel like this is a solid back to school activity that accomplishes both goals of establishing a collaborative environment through getting to know one another and of introducing some of the tech tools students will be using all year long and allowing students to become familiar with it. 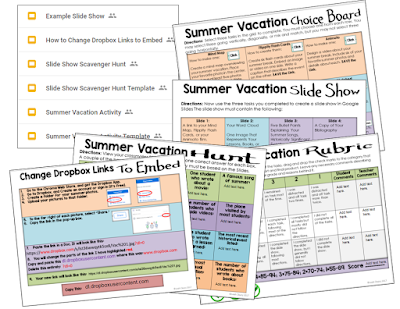 I've made the activity available, complete with video tutorials, examples, choice board, rubric, scavenger hunt, and customizable templates for your classroom. You can get it HERE. If you want to start from scratch and make your own to perfectly fit your classroom needs, here's what you'll need to consider. Start by considering your objectives. What do you hope to accomplish? Then think about add-ons, apps, extensions, and other tools that you plan on using throughout the course. What would it most benefit your students to understand right away? I've described a few useful ones HERE. Consider making short video tutorials of each tool so that the activity is self-guided for the students and you don't find yourself answering the same questions repeatedly. You can link to the tutorials right in the project. Then you can add the tutorials to the "About" section of Google Classroom, or whatever classroom app you are using, so that students can refer to them throughout the course as the need arises. An easy and free way to make the tutorials is with Screencastify, a free Google Extension. I have a tutorial for using it HERE. Then consider the task or tasks you want the students to complete. Do you want the tasks to culminate into a final product or do you just want to leave it as a series of activities or even one activity that requires a few tech tools? How do you want the students to share their creations with the class. Will they present? Will they post them in Classroom? Will they create QR codes? Consider Back to School Activities you have done in the past. Consider how they can be re-purposed with technology. Will you score the activities? What will your guidelines be? 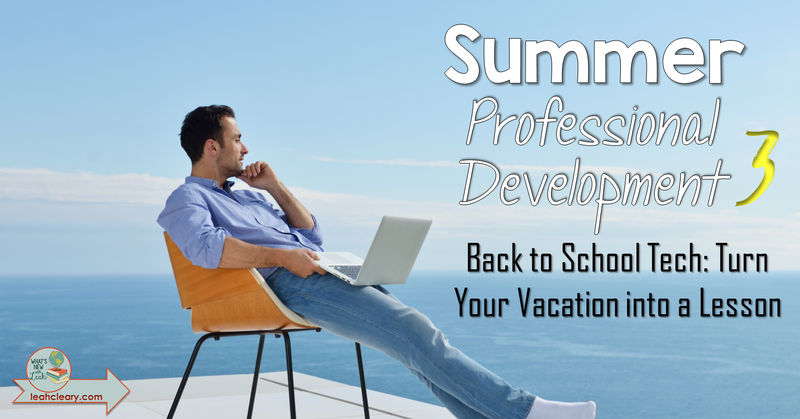 Be sure to download this planning sheet complete with useful links to help you get started on turning your vacation into a lesson. And don't forget to check back next week to consider the brain benefits of gamifying. How will you be handling back to school activities in the blended classroom? 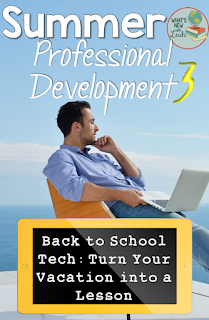 Will you "kill two birds with one stone" and use them to introduce technology tools? Leave a comment below and let me know!